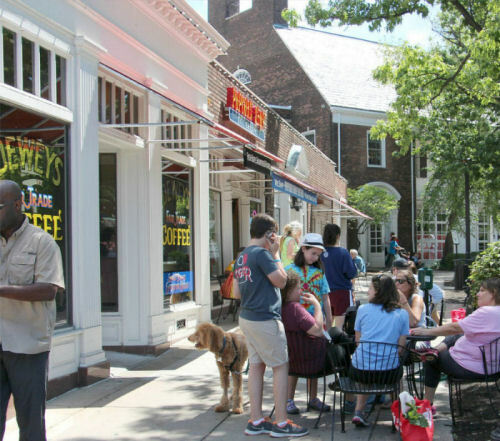 Shaker Square is a place for everyday shopping and services, plus some hard-to-find items, and for anyone who wants a broad choice of casual or fine dining places, from breakfast to dinner, almost all with patios, and for moviegoers. Its restaurants and stores are locally owned and nearly all are unique to the Square. 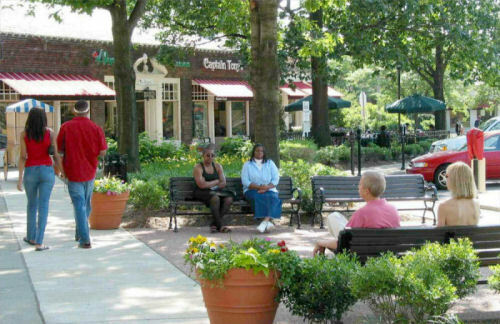 Stroll the Square, shop and dine here. You'll enjoy the diversity and the sense of neighborhood — a welcome change from today's impersonal, "big box" shopping. Our Home page says Shaker Square is where Cleveland and Shaker Heights meet, but that's a concept, not a fact. Shaker Square is in Cleveland, at its eastern end, about a quarter-mile from the start of Shaker Heights. Because of an agreement made in 1912, the Square and many streets around it are in the Shaker Heights School, Library and Recreation District. Learn about that agreement. It is also up the hill from University Circle and the Cleveland Clinic, and only 12 minutes from downtown on the two light-rail Rapid Transit lines that stop at the Square. The Square was built in 1927-29 by Otis and Mantis Van Sweringen, the brothers who developed Shaker Heights. The oldest shopping district in Ohio and the second oldest in the nation, Shaker Square was listed in the National Register of Historic Places in 1976. For more on the history of the Square, click here. What you see at Shaker Square today the result of nearly 90 years of responsible ownership, enhanced by a multi-million dollar renovation in 2000-2001. But Shaker Square is more than a shopping and dining area. It is the heart of a lively, diverse neighborhood. Near the Square are more than 4,000 units of high-quality rental and condominium apartments — the largest concentration of multi-family housing in Cleveland — plus townhouses and many private homes. These words have gone to Washington. To learn how, click here.